I came up with a simple idea but I don't know if it is really secure or not. I know that you shouldn't create any algorithm on your own. I'm just curious, that's all. Your idea is no stronger than simply having a common shared password $P_1$ from which the symmetric encryption key is derived. You assumed the hash of Bob's password – $H(B_1)$ – is public, so if Eve knows both it and the common password $P_1$ she can calculate $H(B_1)||H(P_1)$. She doesn't need to know $B_1$ itself. A program can be written to require the password $B_1$, but Eve could write her own program that accepts either the hashes or the passwords. I.e. unless you assume $H(A_1)$ and $H(B_1)$ are private, they do nothing. If you do assume that, they effectively become part of the shared secret. Yes, but the problem of sharing the common password $P_1$ remains. If you can securely exchange that password, you can likewise securely exchange GPG keys or any other encryption keys. Not the answer you're looking for? 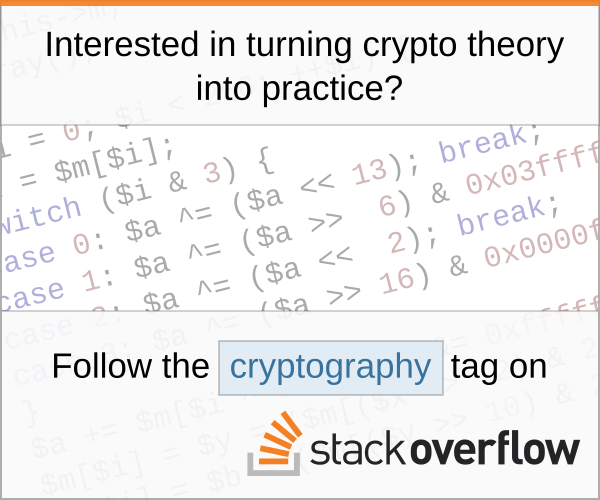 Browse other questions tagged encryption algorithm-design password-based-encryption or ask your own question. Is there a way to do fair exchange between two parties who don't trust each other?